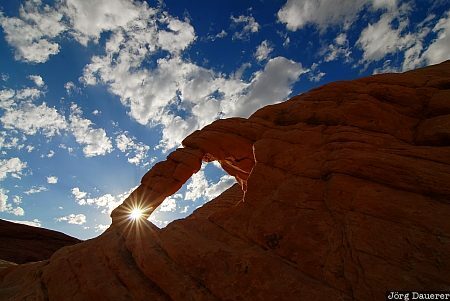 The sun peaks through a small hole next to a small natural arch in the fantastic sandstone maze of Valley of Fire state park. I had to get down very low on the ground with my camera to have the sun shine through the small hole. Valley of Fire is north of Las Vegas in southern Nevada, United States. This photo was taken in the afternoon of a cloudy day in October of 2006. This photo was the image of the month in August of 2010. This photo was taken with a digital camera.